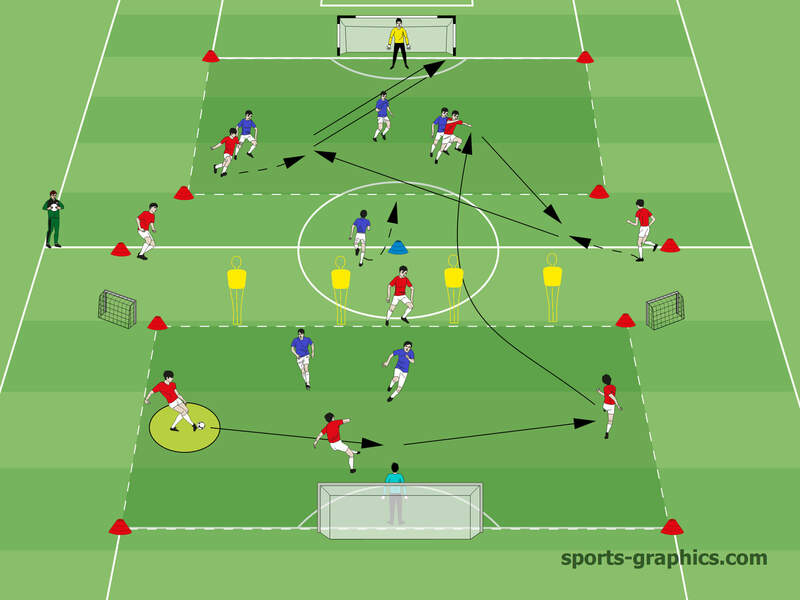 Red and Blue are engaged in combination play in their group, from one passer to the next. The activity is initiated by a player on the outside who dribbles into the area. Dribblings by the players on the outside should be executed at high speed and with conviction and then with a pass out of this dribbling. The receiving player inside the square has to adjust his movement accordingly. Limited touches; change player roles. The game is played in 4 zones between the penalty areas. The offside line is always the last line of the last own zone. There are no setplay situations. The keeper of the team with the ball initiates play. The coach might prescribe a certain formation, such as a 2-2-2. Based on this formation, the aim is to establish numbers up in each zone. Zones need to be dribbled through or passed through. In the first zone, 3 in Red (+ one “wall-player”) against 2 Blues. The other area can only be passed to with a lofted ball., In that zone, 2 red players are playing a man down against 3 blue players. 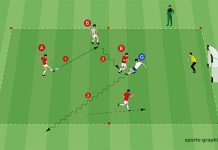 Once the lofted ball is played, a red player as well as the central blue player start a 3 reds v 4 blues activity. If the blue team manages to head the ball back defensively into the first zone, Blue is free to finish on the large goal. The game is played until a goal is scored or until Blue wins the ball and counters (small goals). Red should take advantage of the 3 v 2 numbers-up and play a quality lofted ball. 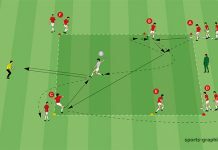 After the lofted ball has been played, the ball-near red player should get involved in the play and take care of the second ball. After winning the ball, the blue team could play a through-pass and counter to the large goal. Which impact has the build up of a back three on the rest of the formation? What is the correct build up of a back three? What advantages and disadvantages come along with a back three?